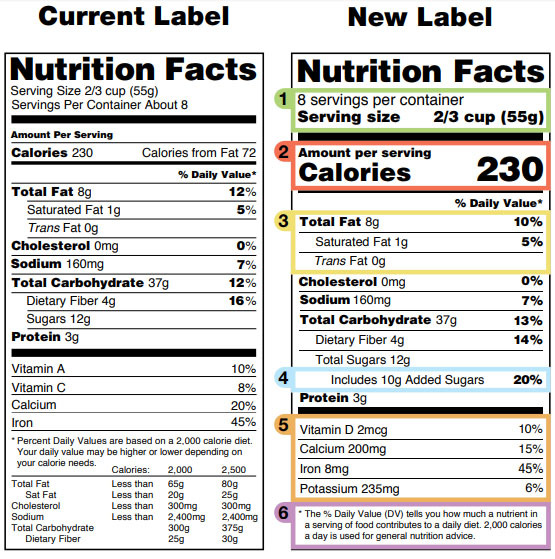 The new food label is mandated to be implemented in 2020. The amount of added sugar to the food product has to be shown in the new label. Preheat oven to 18oºC/35oºF. Grease a 8-inch x 12-inch slice pan. Line base with baking paper, extending the paper 2-inches over long sides. Place syrup, dates, salt and the water in a small saucepan over low heat. Simmer for 5 minutes or until dates are soft. Stir baking soda into date mixture, transfer to a food processor. Process until smooth. Return date mixture to pan. Add butter, stir over medium heat until butter melts. Pour mixture into a large bowl to cool for 5 minutes. Whisk in eggs, one at a time. Stir in sifted cocoa, ground hazelnuts, flour, sour cream and chopped nuts. Spread mixture into pan and level top. Bake brownie for 30 minutes or until a skewer inserted into the centre comes out with moist crumbs attached. Cool in pan. Dust with extra cocoa, then cut into squares. Makes 24 servings (1 square per serving). Ruby offers an intense sensorial delight, a totally new taste experience: neither bitter, milky or sweet, but a tension of fresh berry fruitiness and luscious smoothness. Ruby cocoa beans grow under unique climate conditions and can be found in Ecuador, Brazil or Ivory Coast. Children who see young social media influencers promote junk food may consume more unhealthy calories, a new study suggests. Advertising aimed at kids has long been linked to an increased risk that children will make unhealthy food choices and press their parents to buy them more processed, sugary, and calorie-loaded foods. Studies also suggest children can be easily swayed to try junk food endorsed by celebrities and cartoon characters. Less clear, however, is how their eating habits are impacted by social media influencers. For the current study, researchers in the UK recruited 176 children, ages 9 to 11, and showed them Instagram profiles for two of their age group’s most popular YouTube video bloggers. The children were randomly assigned to view three types of Instagram profiles: healthy food marketing, junk food promotions, or endorsements unrelated to food. After kids saw the Instagram profiles, researchers served four snacks – jelly candy, chocolate buttons, carrots, and seedless white grapes – and let kids eat as much as they wanted for 10 minutes. None of these foods were the same items kids saw on Instagram. On average, kids who saw junk food promotions consumed 448 calories, compared with 389 calories for children who saw healthy food marketing and 357 for those who didn’t see any food promotions, the study found. While all of the kids ate much more candy than carrots or grapes, kids who saw junk food promotions consumed more sweets than the other children: an average of 385 calories compared with 320 calories for kids who saw healthy food marketing and 292 calories for those who didn’t see food promotions. “Children look to social media for role models, and are likely to imitate the behavior of media characters that they look up to and admire,” said lead study author Anna Coates of the University of Liverpool in the U.K.
“Unlike adults, children are more impulsive and are less motivated to resist food marketing as they are not driven by long term health goals,” Coates said by email. One of the YouTube stars shown to kids in the study was a 26-year-old female with about 12.1 million subscribers on YouTube; the other was a 23-year-old male with about 4.1 million subscribers. There wasn’t a meaningful difference in the total calories consumed or the amount of candy eaten by kids who saw healthy food promotions or no food marketing at all, researchers report in Pediatrics. One limitation of the study is that many of the kids were already familiar with the two video bloggers featured in the experiment, and it’s possible that their food choices were impacted by how much they liked or disliked these “vloggers” before they joined the study, researchers note. Another drawback is that the experiment didn’t look at how kids may actually engage with social media content, the study authors note. It didn’t assess how children might be influenced by content “liked” or shared by their friends in the real world. Even so, the results offer fresh evidence of how social media can negatively impact kids’ eating habits, said Jennifer Harris of the Rudd Center for Food Policy and Obesity at the University of Connecticut in Storrs.